ab14613 labels all PDE4D proteins including PDE4D1, PDE4D2, PDE4D3, PDE4D4, PDE4D5 variants. Does not cross react with PDE4A, PDE4B, PDE4D6, PDE4D7, PDE4D8, PDE4D9 or PDE4C. The antibody has not been tested against endogenous PDE4D, only recombinant proteins and we therefore cannot guarantee it will detect endogenous PDE4. C-terminal cyclic peptide unique to all PDE4D subtypes variants. Our Abpromise guarantee covers the use of ab14613 in the following tested applications. WB 1/500. Can be blocked with PDE4D peptide (ab169991). Widespread; most abundant in skeletal muscle. Isoform 6 is detected in brain. Isoform 8 is detected in brain, placenta, lung and kidney. 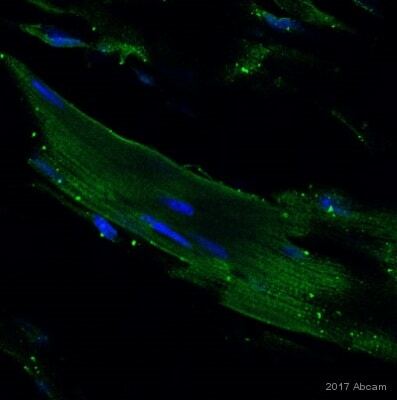 Isoform 7 is detected in heart and skeletal muscle. Note=Genetic variations in PDE4D might be associated with susceptibility to stroke. PubMed:17006457 states that association with stroke has to be considered with caution. Isoform 3 and isoform 7 are activated by phosphorylation (in vitro), but not isoform 6. Isoform N3 and isoform 12 are phosphorylated on Ser-49, Ser-51, Ser-55 and Ser-59. Cytoplasm. Membrane. Cytoplasm > cytoskeleton. Cytoplasm > cytoskeleton > centrosome. Found in the soluble fraction, associated with membranes, and associated with the cytoskeleton and the centrosome. 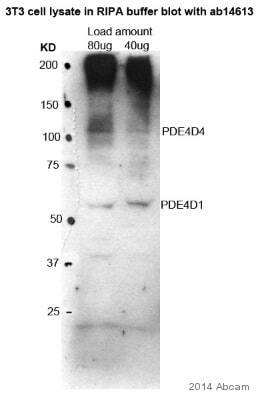 Western blot using ab14613 and positive controls for PDE4D variants. ab14613 (2µg/ml) staining PDE4D in human placenta using an automated system (DAKO Autostainer Plus). Using this protocol there is strong staining of the cytoplasm. ICC/IF image of ab14613 stained HeLa cells. The cells were 4% formaldehyde fixed (10 min) and then incubated in 1%BSA / 10% normal goat serum / 0.3M glycine in 0.1% PBS-Tween for 1h to permeabilise the cells and block non-specific protein-protein interactions. The cells were then incubated with the antibody (ab14613, 10µg/ml) overnight at +4°C. The secondary antibody (green) was Alexa Fluor® 488 goat anti-rabbit IgG (H+L) used at a 1/1000 dilution for 1h. Alexa Fluor® 594 WGA was used to label plasma membranes (red) at a 1/200 dilution for 1h. DAPI was used to stain the cell nuclei (blue) at a concentration of 1.43µM. Publishing research using ab14613? Please let us know so that we can cite the reference in this datasheet. In view of the current situtation, I would like a replacement of ab14628. It seems some of the references for this antibody has produced accepted results. Thank you for your reply and for your understanding in this matter. As requested, I am sending ab14628 as a free of charge replacement for you and you should have it on Tuesday morning. For your records the new invoice number is *. Just to follow up about our previous conversation about acquiring WB pictures for the antibody I ordered. Have you heard anything back from the supplier? I have tried 3 times to contact the supplier to ask them to provide those images, but they are not replying to my emails. I do apologize for the inconvenience this is causing you and I am grateful for your patience in the matter. I believe the best way forward is to replace or refund the cost of the antibody for you. Please let me know how you would like to proceed and I will be happy to bring about a resolution to this issue. I have heard back from the supplier in regards to ab14613 and they have tried to go back and look for old data on PDE4D antibody. They could not find the blot on HEK cells. They do have blots on other cells lines including SHS5Y neuroblastoma, rat primary neuronal cultures and in cells over expressing various PDE4D subtypes but not HEK293 cells. Those images were not included in the email they sent me. I am very sorry about this matter and I would be happy to either replace or refund the current vial of ab14613 that you have. Please let me know how you would like to proceed in this matter. Thank you for contacting Abcam earlier today. I am sorry about the western blot issues you have been having with ab14613. The antibody is covered under our Abpromise for six months and is guaranteed to work in western blot on human samples . If we cannot resolve the issue you are having with the antibody then I would be happy to either send a replacement antibody or to process a refund. I have talked to the lab about this and they have told me one of the reason there is a band at 30kDa may be proteolytic degradation. We have checked this antibody on HEK cells and it labels 3 different PDE4D variants. Do you include protease cocktail during sample preparation? If not, I would suggest that you repeat the lysis and include the protease inhibitors. If you already do include protease inhibitors, then I think there may be an issue with the antibody and the best way forward is to send you ab87239 as a free of charge replacement (as we discussed on the telephone). I wonder if you could give me some advice please. I want to purchase an antibody which can be used to detect ALL 9isoforms ofPDE4D (phosphodiesterase type 4D). From what I can gather, you have 16 antibodies for PDE4D, I have purchased one previously (ab14613) but this is only specific toisoforms PDE4D1, PDE4D2, PDE4D3,PDE4D4 and PDE4D5. The only other which appears to be similar to what I'm looking for is ab59249, whichstates "This antibody detects endogenous levels of totalPDE4D protein". However, when looking further down the page at the images, there appears to be only one band in the resulting WB. This is strange since that of the 9 isoforms, 6 are long and 3 are short i.e. I would expect to see 2 bands on the WB (as you do with ab14613). Please could you explain the situation and also advise on which antibody I would be best purchasing? Thank you for contacting us. I apologise for the delay, I wanted to check this case with my lab colleagues. Regarding ab59249, the amino acid range of this immunogen is aaXXXX of human PDE4D with accession# Q08499 (http://www.uniprot.org/uniprot/Q08499). This antibody binds to isoforms 4, 3, 5, N3, 8, 9, 7, and 12. It does not bind to isoform 10, 1, 2, and 6. According to the isoforms that this antibody binds, you would expect to see two bands, approximately 25 and 85 kDa. Because the western blot on our website is cut off at 34 kDa, we can retest this antibody to see if it does actually bind the lower isoform as well. And ab87329’s immunogen is present in 8 out of 12 of them so it should detect isoforms 1- 10. I am sorry these products did not perform as stated on the datasheet and for the inconvenience this has caused. As requested, I have issued free of charge replacements for ab14611 and ab14613with the order number 1137676. Dear Sir/madam, We have ordered some antibodies form your company before. Now we'd like to see the role of PDE4D protein in human smooth muscle cells. So I'm just wondering if your product of anti-PDE4DIP antibody(ab121375) and anti-PDE4D antibody(ab14613) can be used in our cells and how the efficiency is. Also, We appreciated it very much if you can send us the free samples for these products ? Because we carry over 70,000 products, it isn't feasible for us to keep small sample sizes of our products. Please contact our Scientific Support team by replying to this email prior to purchase for more information. Thank you for contacting us and sorry for the delay in response. I now have confirmation of the specificity of the two antibodies in question. ab14613 has been raised against a C-terminal peptide sequence of PDE4D. This peptide, contrary to what was published on the datasheet should recognise all 9 isoforms. I am sorry for this misinformation. This is as a result of science moving on and new isoforms being identified. This will now be updated on the datasheet. Similarly, ab77080 has been raised against the C-terminal amino acids (QPEACVIDDRSPDT) of human PDE4D this should also detect all 9 isoforms of PDE4D. If you have any further questions please do not hesitate to ask.